The double acting tapered roller thrust bearing, VVFT, is designed to handle thrust loads in either direction. The use of two tapered V Plates, one flat center plate and two tapered roller assemblies, gives this bearing the ability to handle the high thrust loads inherent in rolling steel bar and structural shapes. 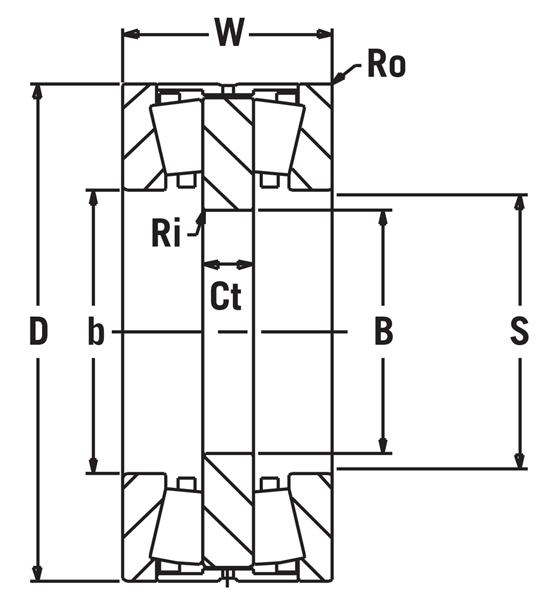 In this application, the thrust bearing compliments a four row cylindrical roller bearing, AD-D, that handles radial load or roll separating forces, and in some designs, a single row deep groove ball bearing, DGB, is used for piloting the chock onto the roll neck. These are manufactured in popular rolling mill sizes with metric bore diameters and are dimensionally interchangeable with other manufacturers. Some VVFT deigns for hot flat rolled product mills incorporate a key way in one or both sides of the center plate that engages with a keyed drive spacer located on the roll neck. A single or double sealed version is made possible with the use of seal carriers or plates. These plates typically include an O-ring mounted in a groove of the plate O.D. for added sealing. In applications requiring a preloaded thrust bearing, the use of coil or bevel spring sets and plungers installed in the V Plate or Seal Plate, keep the unloaded half of the bearing rolling. This is necessary to help prevent sliding friction between rollers and races on the unloaded side. Consult Engineering for additional features needed for your application.